HVA will develop a “learning zone” at trail site by Webatuck Creek. The Housatonic Valley Association (HVA) has been awarded a significant contract from the Harlem Valley Rail Trail Association (HVRTA). These funds are part of a New York State Office of Parks, Recreation and Historic Preservation Environmental Protection Grant awarded to the HVRTA for the development of an outdoor environmental education project. This project will support the creation of scientific and educational content for a new outdoor education experience along the Trail. The project will leverage the repurposing of a legacy railroad bridge to create an immersive learning zone and supplemental educational resources for users. 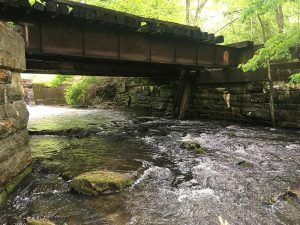 The site is a short walk from the Village of Millerton, at a railroad bridge over Webatuck Creek. The bridge is currently unsafe and slated to be replaced as part of the next phase of trail construction. The new bridge will be part outdoor classroom and part trail, with outstanding views of the stream, riparian areas and floodplain. Creation of the site will be a collaborative effort with HVRTA, bringing together HVA’s watershed science expertise with creative interpretations from the Wassaic Project and educational guidance of the Webatuck Central School District. HVA will lead a coalition of artists, scientists and educators to create a STEAM-centered learning lab. STEAM is an educational approach to learning that uses Science, Technology, Engineering, the Arts and Mathematics as access points for guiding student inquiry, dialogue, and critical thinking. STEAM education is experiential, collaborative, and creative. It allows students to work together, solve real-world problems, and work through a creative, inspiring process. The project builds momentum behind the work of the Ten Mile River Watershed Collaborative. The Collaborative is a diverse group of partners that are each committed to protecting the health of the Ten Mile River and the communities in its watershed. This partnership of federal and state agencies, county and local governments and non-profits meet regularly to discuss watershed issues and brainstorm shared solutions. The Collaborative is also a forum for educating key stakeholders about watershed management issues, including non-point source pollution, flood damage prevention, and climate change. HVA helps to coordinate Collaborative meetings and serves as a liaison between Collaborative members.